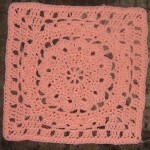 It’s time to start block #3 for the year long Moogly Afghan Crochet-a-Long! If this the first you’ve read about this fun series, please click HERE to read all about this Crochet-a-Long and how it works, and to get the pattern for block #1! All caught up? Then read on! Also, please remember that there is a Ravelry group for the Crochet-a-Long, where you can go to show off your photos and ask for extra help if you need it – and visit with others in the Moogly community! You can click HERE to visit, join in, and be excellent to each other. And now for Block #3! This one was easier but interesting enough to keep my attention! To bring it up to 12″ I worked an extra round of the pattern (following the idea for Round 10 on the popcorn sides and Round 11 for the cross stitch sides), followed by a round of single crochet, and I’m very pleased with how it turned out! I did spot a couple of errors in the pattern, I think – I’ve notified the designer but haven’t heard back on that yet, but it could be my own error. I *believe* that the Round 10 repeat should end with “dc in the next 5,” and that the Round 11 repeat should say dc in the next 8″ rather than 10 (skipping the chs – this keeps the stitch count on each side the same), and should end with “dc in the next 7.” Let me know what you think when you make it! Once you get going with the pattern though, it’s easy to play with a little bit, and make it your own – I noticed lots of subtle variations in the Ravelry gallery linked above! 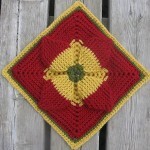 I hope you all enjoy it, and come share your photos on Facebook and Ravelry! Kicking Off the 2014 Moogly Afghan Crochet-a-Long: Block #1! I gave an audible gasp when I saw this, this morning! (And I’m here, alone… 😉 Trust you’re staying warm in IA…we are trying to, here in Nebraska. I think I need another cup of coffee! Sorry about that Jeanette – typo! 🙂 All fixed now. Glad you like it! 😀 It’s cold here too, but as we know, it could be worse! Can you tell me how many of these will be solid colors? 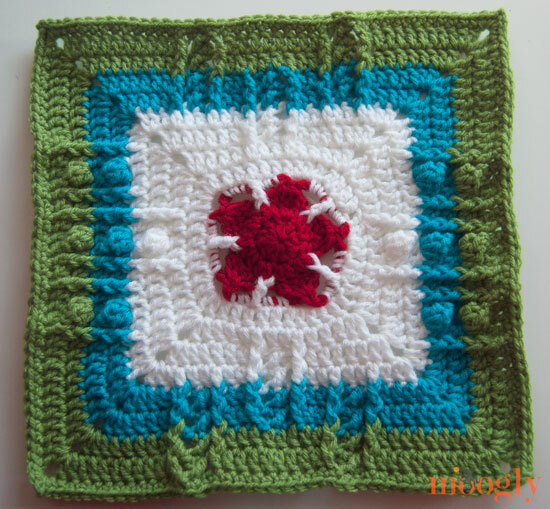 I am thinking of maybe making a couple of solid ones in all of my colors, as fillers for the blanket, to make it bigger. Not all the squares are nailed down yet, I’m still waiting to hear from some of the designers. I think there will be at least 2, and a 3rd that only uses 2 but could easily be solid. I finished weaving in ALL my ends for blocks 1 & 2 last night in anticipation of this block. I definitely like it much better with more colors. As it’s designed to be all one color I can see myself remaking it more than once to get a look I like vs. having it written up with color changes. I found the same errors you did in rows 10 and 11. Thanks for the heads up about them. I’m not trying to be mean. Just being honest. Hi Joy! Your first comment didn’t go through, but if you don’t like the square, please refer to the instructions in the first post about the CAL – you’re always welcome to pick a substitute! Not every square is guaranteed to be to everyone’s taste. 🙂 Let’s keep it positive! By my count, since the Round 10 repeat ends with one DC, it only needs four more to reach the corner. The same thing applies for Round 11 – the repeat ends with one DC, so six more gets you to the corner. I think you’re right about 8 DC (vs. 10) on Round 11, though! This designer has made some beautiful blocks! I’m thinking about making both the “Standout Star” and “Celebrating The Heart” blocks. Possibly doing one in each of the three colors I’m currently using. Great fun trying this square. I don’t think there is an error at the end of row 10 but can see why it may look like it should read “DC into the next 5” instead of the “DC into the next 4 and work corner”. I think it is all to do with the position that your FPDC is laying in. If it isn’t laying flat it exposes the stitch behind and I could quite easily have needed to do the DC 5 instead of the printed DC4. I stuck with 4 and it works out fine and the square is then symmetrical each side of the tower stitches. I did the written instructions for row 11 and it works out fine. I altered row 12 to a row of SC ( UK DC) instead of the printed DC so that my square would end up the same size as my other 2. Oh dear, 24 blocks, not 12! Sorry! Wasn’t thinking, clearly! Thanks RB, such a brain fart on my part! Must’ve been thinking about 12 months lol. The polls haven’t been getting a great response for a while, and I’ve had trouble thinking of good questions, but it will probably come back after a little break! If we make 1 of every square what size bed will it fit ? I plan on doing just that!! I am really new at this and I understand how to make a dc decrease but am not clear how to do 3dc decreaeses and then 4 (round 3). I have tried it a couple different ways but it doesn’t look right. Please help me as I have made the other two squares and am really enjoying learning except am stumped with this. Thank you! Hi Traci! 3dc decrease, or dc3tog, is done the same way as a dc2tog but with one extra stitch. So just like a dc2tog, you start one dc, and stop with two loops on the hook. Then you start a dc in the next stitch, and stop with 3 loops on the look. Then for a dc3tog, you start a 3rd dc in the next st, and stop with 4 loops on the hook. Finally, yarn over and pull through all 4 loops on the hook. For a 4dc decreast, or dc4tog, it’s exactly the same as above, but before you finish you start a 4th dc in the next st and stop with 5 loops on the hook – then yarn over and pull through all 5 loops. 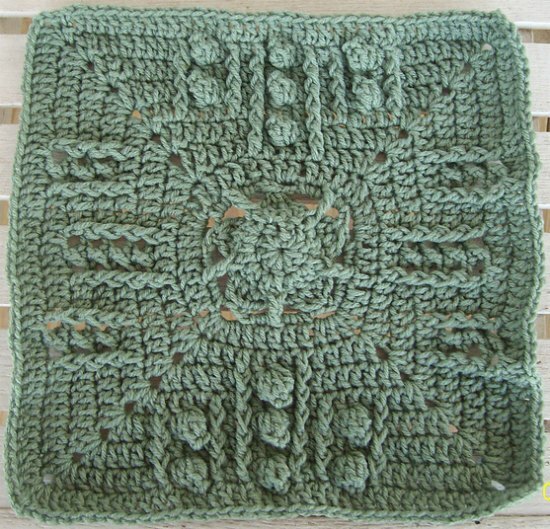 Tamara, you said: “To bring it up to 12″ I worked an extra round of the pattern (following the idea for Round 10 on the popcorn sides and Round 11 for the cross stitch sides), followed by a round of single crochet.” I counted your rounds and the original square’s rounds but I don’t see a difference. Except for your round of single crochet. Am I mistaken? The pattern calls for doing the final round in plain dc, if I recall correctly. This still left me short, so I repeated a pattern row (with post stitches and such) and then to replace the plain dc edging I added the plain sc row. Does that make sense? While I found this square to be the most difficult, I really like the finished product. This is my first CAL and I’m having so much fun. I feel like a kid every two weeks waiting for the new pattern to come out. I happened upon this site in December when I was looking for crochet gifts and I’m so glad I did. It has taken my crocheting to a new level. I love the patterns, especially the infinity scarf. Great job and thank you, Tamara! Tamara, I am so inspired by you. I love your patterns, and I especially love your video tutorials. 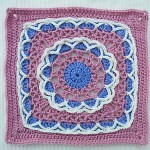 I know you must be busy, but is there any way you can create some video tutorials for these crochet along blocks? The only one I have been able to figure out is the CAL one. I tried many times to do the last block but can’t get the hang of it. I learned to crochet many years ago, but only picked it back up 2 1/2 years ago. Keep up the great work Tamara!!!! Hi Jane! Thank you so much! Unfortunately, I cannot do videos of patterns that aren’t mine, as that would be copyright infringement. I’m hoping to get word of a tutorial for #3 soon. In the meantime, do check out that Ravelry group if you can – there are lots of people there who’ve made it and who might have just the tip you need! Hi. I am struggling with this one. Can someone enlighten me on round 4 please. Are all the DC decreases groups worked in the same stitch? Hi Simi! I think you’re referring to Round 3? You work the 4 dc decrease over 4 sts – turning those 4 sts into 1. Does that help? Hi this is my first attempt at such a large granny square and I am having some trouble with it. For some reason after the 8th row my corners flare out making it so it doesn’t lie flat. If I set it down it looks like some sort of distorted butterfly. This is my second attempt and I don’t know what I am doing wrong. Any ideas? Hm, I’m not sure Katie! I do know the pattern was updated recently – you might want to make sure you have the most recent update. It sounds like you might be adding stitches somewhere? I tried the new pattern and it was less butterfly shaped but still flared out at the corners. Could I be working the corners wrong. I have been doing 2dc, 2sc, 2dc. Is there anything I can do differently to help this? You could try dropping some stitches from the corners – maybe a dc, ch 1, dc? It would take some experimentation. Hi Katie, you said you were making 2 dc, 2 sc, 2 dc in each corner. The pattern says to make the corners with 2 dc, 2 chain, 2 dc. Try the corners with chains and see if that doesn’t help. Hii Mandy, I am doing chains and not sc I just messed up my terms. I just started crocheting about 6 months ago. Sorry for the confusion. I cannot for the life of me get this square right, so it’s been dispatched to the naughty corner and I’m moving onto square 4. 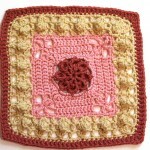 I may try again or do a different square to replace it. I cannot get this square right. I’ve dispatched it to the naughty corner. I might replace this square with another. I’m with you on this one, I just can’t get it right?! Where are the video tutorials I’ve read about? I seem to be missing something. I am having trouble figuring out row 10 of block #3. I got side one yo come out correctly.but for some reason i am stumbling with the secone side. Anyone help please?